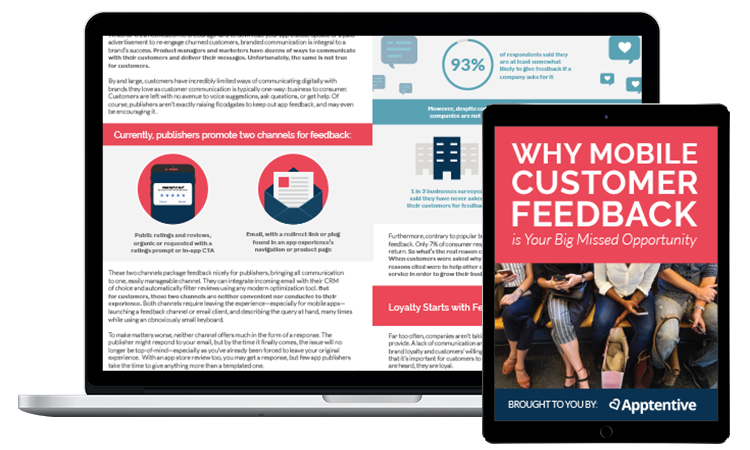 Collecting and making sense of customer feedback isn’t a walk in the park for product managers and marketers. The collection process is a big analytics challenge across various channels, and it can take months to set up a first version of a feedback collection and implementation process—and years to get it right, especially as the size of your customer base grows. Conversely, many customers feel that providing feedback is simply too time consuming, too annoying, and too much of a hassle. It’s much easier for them to simply uninstall an app or search for a competitor, and move on to the next alternative. Customers don't feel heart or listened to, which results in heartache and frustration. But it doesn’t have to be this hard. There are easier ways to gather customer feedback and turn it into your brand’s biggest strength, unique only to your business. This guide outlines the possibilities. Conversely, many customers feel that providing feedback is simply too time consuming, too annoying, and too much of a hassle. It’s much easier for them to simply uninstall an app or search for a competitor, and move on to the next alternative. Customers don't feel heard or listened to, which results in heartache and frustration.